February 8, 2019 — The Connecticut Audubon Society’s Roger Tory Peterson Estuary Center (RTPEC) is pleased to announce the appointment of Alisha Milardo as its new center director, effective February 11, 2019. 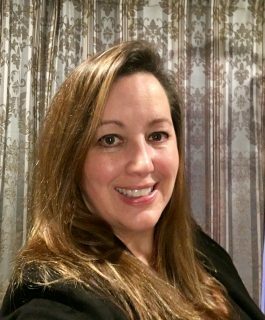 Ms. Milardo joins the RTPEC after 18 years with SoundWaters, where, most recently, she was vice president of education. SoundWaters is a Stamford, CT-based organization aimed at educating and inspiring children to understand, value, and protect Long Island Sound. Ms. Milardo holds a degree in marine science from Hawaii Pacific University. She is a resident of Waterford, CT. Located at 90 Halls Road, Old Lyme, the Roger Tory Peterson Estuary Center works to conserve and safeguard the coastal and estuarine environment of southeastern Connecticut, with a particular focus on the Connecticut River Estuary. This mission is carried out through science-based education, research, and advocacy programs that educate and inform the public and encourage conservation of the diverse ecosystems of the region, its habitats, and its wildlife. Ms. Milardo succeeds Eleanor Robinson, who has served as center director since 2016. Ms. Robinson will return to the RTPEC board, of which she was a founding member. Connecticut Audubon Society’s mission is to conserve Connecticut’s environment through science-based education and advocacy focused on the state’s bird populations and their habitats. In addition to the Roger Tory Peterson Estuary Center, it has centers in Fairfield, Milford, Glastonbury, Pomfret, and Sherman, and an EcoTravel program based in Essex.